This year marks the quasquicentennial anniversary (that’s 125 years) of the Gurkha brand name, and Beach Cigar Group, the maker of Gurkha cigars, has marked the occasion by changing its name. The manufacturer of “the world’s most expensive cigar” is now the Gurkha Cigar Group. It’s a sensible name change, and for a company well versed in the subtle art of branding it seems a long time coming. A few other changes have occurred at Gurkha in the past year — a new president and CEO is at the helm (Gary Hyams, formerly of CAO), and a new subsidiary brand was launched: East India Trading Company. And while the company still produces very high end “luxury” cigars like the cognac-infused His Majesty’s Reserve, they have renewed efforts to engage the unwashed masses, represented here by yours truly. Three new blends released last year at the 2011 IPCPR were geared toward the retail market, and for the moment this one appears to still be a brick-and-mortar exclusive. The Gurkha Cellar Reserve utilizes a Criollo 98 wrapper, a Dominican Olor binder, and filler which includes 15 year-old Nicaraguan Criollo. In line with the “cellar” theme, this cigar arrives in a box that is ribbed like a wine barrel. (I don’t always like Gurkha blends, but Hansotia’s baroque boxes are the best in the business.) The bands are just as odd and beautiful, though in this case the information is a little bit confusing. The Prisoner is, to my mind, more of a double corona than a churchill. This is a cannon of a cigar, and with its somewhat veiny and dark colorado maduro wrapper it’s a serious looking stick. The head is nicely formed. The cap is not a work of art but shears cleanly and does its job. The large band has the effect of minimizing the size of the cigar, or putting it into a different perspective somehow. Optical illusions aside, this is a good 1.5 to 2 hour smoke. I’ve smoked five or six of these now and each one has shown excellent construction. The cigar feels a bit light in the hand, but that is no indication of its burning characteristics, which are generally slow, even, and cool. Each time I ashed this cigar it fell into the ashtray like a fat piece of chalk. The Prisoner starts up with a sweet grassy flavor but after a puff or two the oaky-vanilla aroma begins to remind me of the wine cellar theme of this cigar. The smoke is smooth but somewhat dry on the palate. After a minute or two the base flavor turns from sweet and grassy to roasted nuts. After about twenty or thirty minutes the flavors begin to deepen without venturing into any new territory. The aftertaste grows slightly peppery, and the strength becomes more evident. The oaky-vanilla aroma is still the highlight of the cigar. 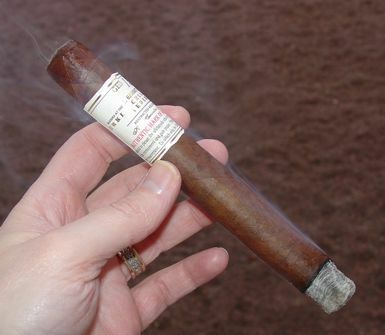 Into the third section the Prisoner is a consistent and straight-forward cigar without a lot of complexity. The aroma is very pleasant, and by the last third it delivers a pretty good kick. It starts to char near the band and after that becomes a little too sharp to smoke. But after 90 minutes I am ready to call it a night anyway. Gurkha’s Cellar Reserve is an enjoyable cigar but it lacks the kind of complexity I was hoping for. I might smoke this one again in a smaller size because the flavors are good, but 90 minutes of plain ol’ good can still get a bit monotonous. The price is a little bit high for me as well — MSRP runs from $8 to $10 for this line. I was fortunate enough to recieve these samples from Gurkha, so I won’t complain about the price… but if I had to shell out the retail I might hesitate a little. He is best known as the former president of Villazon & Co., which was started by his father and his partners in Tampa in 1920. Young Frank was conscripted into the cigar industry, starting out with janitorial duties in his father’s factory, a job that he would have gladly forsaken to spend more time in school instead. But this was the during the Depression, and his choices were limited. As part of his education in the business he soon left for Cuba, where he learned how to select wrapper leaf under the legendary Angel Oliva, Sr., a man who would become first his mentor and later his collaborator. Llaneza was on the ground in Cuba “when Fidel Castro came down from the mountains into Havana.” He saw changes on the horizon, but initially he didn’t see the extent of them. The Castro regime gained strength and finally fomented a revolution, leading eventually to the confiscation of the entire Cuban tobacco industry. Fortunately, Llaneza, along with Angel Oliva, had wisely already begun their first experiments with Cuban-seed tobacco in Central America. Llaneza took over the reins of Villazon in 1953 and continued the company’s tradition of making clear Havana cigars. That changed over the following decade as his continued success with growing excellent cuban-seed tobaccos in Honduras provided Villazon the opportunity to fill the full-bodied cigar niche left open by the embargo. Two of those of those cigars would become mainstays on the American cigar scene for the next fifty-plus years: Punch and Hoyo de Monterrey. Ironically, Llaneza recently retired from General Cigar and is now blending cigars — for Altadis USA. The Siglo Limited Reserve was his first, and the Frank Llaneza 1961 is his most recent creation. The 1961 is made in Nicaragua and features a Criollo 98 wrapper from Ecuador. The binder is Nicaraguan, and the filler is a Nicaraguan-Dominican blend. Cigar Insider picked the Cuban Corona size as the pick of the litter, rating it 92 and bestowing upon it “Humidor Selection” status. 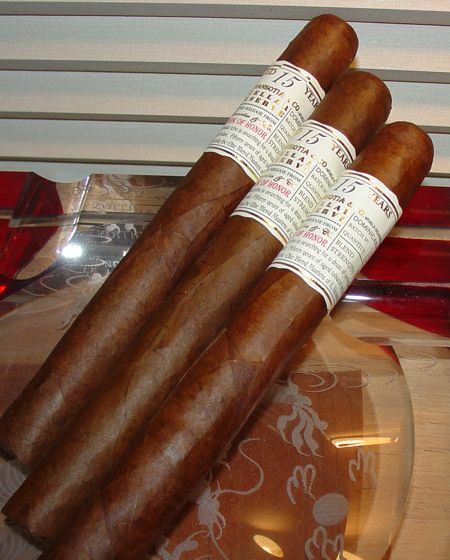 The 1961 Cuban Corona is an unassuming stick with its simple band and dark leathery wrapper. This outer leaf is actually maduro in color; with its leathery appearance and slight sheen of oil, it could pass for a maduro cigar. The head of the cigar is well made and one of my specimens exhibited a quadruple cap. The roll is solid, though one cigar had a very minor dent in one side. The draw is just right and the ash is firm, but it does flake just a little. The burn is very slow. I expected to get 45 minutes to an hour from this stick but it smoldered for almost twice that long. The Cuban Corona is an assertive cigar that announces itself with a leathery bite. There are a lot of flavors here, but they seem to be blended together so well that it’s hard to distinguish between them. In the first third I was a little overwhelmed by the leather and spice, but I was still able to detect a sweet edge to the smoke. The lengthy finish is impressive. I learned quickly not to retrohale this cigar at all. Unless you enjoy the sting of rich peppery tobacco and the sneezes and sniffles that accompany it, you won’t either. But simply puffing on this cigar releases clouds of rich woody spice. There’s some salt here too, which had my palate begging for a Islay malt companion. I was happy to oblige with a glass of Lagavulin. The Cuban Corona comes out of the corner swinging and never lets up for a breather. The last round is not much different than the first, but by this point my palate has taken so many blows that it’s a little bit numb. Pepper, leather, and some cinnamon spice are the main contenders, with the ghost of grilled meat hovering over it all. 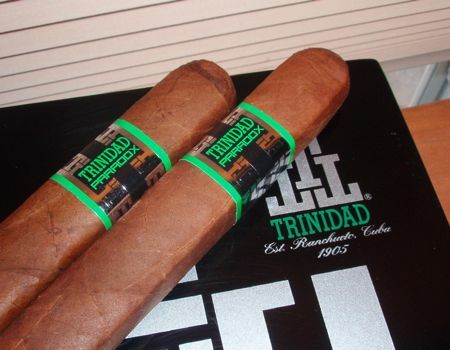 This cigar carries all the characteristics of the Honduran style, despite the fact that it has no Honduran leaf. It reminds me of a Camacho more than any other cigar, minus Camacho’s signature Corojo overtones. But this should come as no surprise, since Frank Llaneza has been making this style of cigar for most of his life. The 1961 blend is much bolder, I think, than any Punch or Hoyo I have tasted, but it shares the same leathery, meaty quality of those cigars. 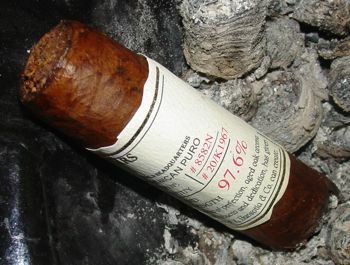 The 1961 is a limited release (see the Stogie Guys review for details) and is retailing for around 7 USD per stick. Cruzado cigars were introduced to the world in an unorthodox fashion last summer when the cigar’s creator, Dion Giolito of Illusione fame, decorated his booth at the IPCPR with pictures of the cult leader Jim Jones. There were those in attendance who immediately condemned this as offensive and in poor taste, which of course it was. But it was more than that, I think. Instead of drawing customers in with the treacle of bikini girls and tv celebrities, he seemed to be challenging us with a twisted kind of advertising archetype, an image of charismatic evil. Instead of hawking his new product (which is what the show is for) he was offering a crowd of starry-eyed cigar fans an opportunity for self reflection, if not outright criticism. At the very least it was unexpected. Ultimately it was more of a comment on the cigar industry (and perhaps the show itself) than anything else. If it showed disrespect for anyone it was the ad execs who drive the cigar business, or whoever the guys are who mix the industry’s Kool Aid. And while I can see his point (without taking it quite so seriously) I think letting Jim Jones to do the talking was a somewhat sideways approach. Provocative, yes, but maybe more dramatic than necessary. Gutsy though, definitely gutsy. Later in the show a sign appeared plastered over the multiple faces of Jim Jones : SOLD OUT. I found this ironic on about seven different levels, but I’ll spare you the post-modern mumbo jumbo. Whereas Illusione is a corojo blend with one component of criollo, Cruzado is a criollo blend with one component of corojo. Illusione exhibits an earthy sweetness in the olfactory sense. The profile of Cruzado is more forward on the palate with leather and spice. They are produced at the Raices Cubanas factory in Honduras using Nicaraguan criollo wrapper, a Nicaraguan binder, and filler from both Nicaragua and Honduras. 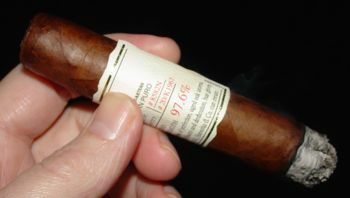 The Dantes is Cruzado’s robusto entry, though the 48 ring makes it seem almost like a short churchill. The wrapper is rustic, a little rough, and the bumpy texture of the binder beneath is easily seen on the surface. The head is triple capped with an attractive pig tail. The pre-light characteristics are unremarkable, but the draw is spot on perfect. It lights up easily and gets things started with a bang — I was expecting a milder entry compared to the Illusione line, but the peppery overture with which this cigar starts is every bit as bold. After half an inch or so the Dantes eases up a little and the differences between this and Illusione become evident. Cruzado lacks the same hickory/hazelnut flavor that makes Illusione so distinct. Instead I pick up freshly cut hardwood with an elusive sweetness on the edge. I’m not sure what it is…caramelized sugar maybe? Occasionally I’ll pass a little smoke through my sinuses to aid in my investigation, but I found the Cruzado to be a little too strong to do this comfortably. The aftertaste is long and earthy, and it stays that way for the duration. The Dantes burns slowly and evenly, wavering only a little here and there, and builds a solid dirty gray ash. The mid-section brings out some cocoa/chocolate flavors and continued earthiness on the palate. The last third is almost Honduran tasting — thick lashings of leather and pepper, almost like a Camacho Corojo, but lighter and more refined. And finally, as the band approaches, there are some hickory notes on the nose that are reminiscent of Illusione. The Cruzado Dantes wins big points for complexity and style — there are some distinctly unusual flavors here, and they’re all balanced very well. Keep in mind that this is still a very Nicaraguan cigar and it comes with the bite — and the buzz — typical of the breed. Like Illusione, Cruzados are not easily found, but at around 8 dollars per stick they should be in the sights of medium to full-bodied cigar fans everywhere.